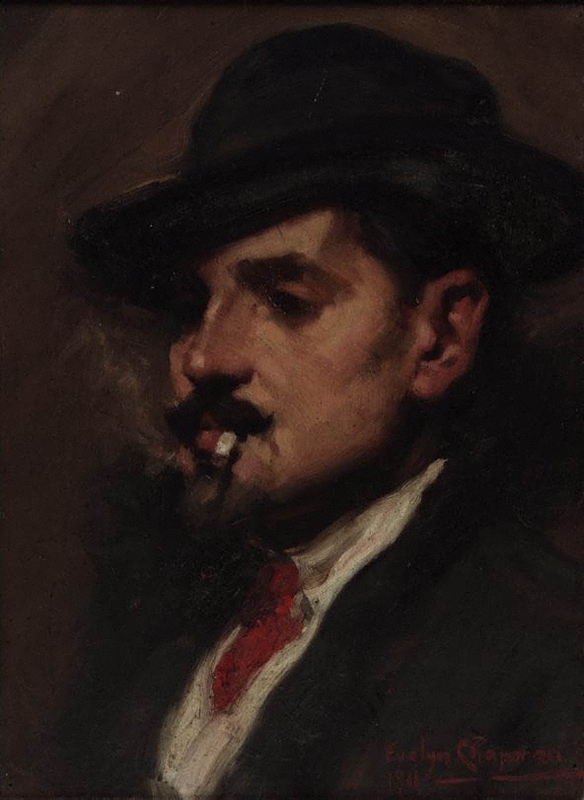 Painter and teacher Anthonio Dattilo-Rubbo (1870-1955) was an Italian immigrant who came to Australia in 1897. In Sydney, he founded an art school in Bligh Street where he taught for forty-three years and was also an instructor at the Royal Art Society of New South Wales school. Dattilo-Rubbo is important to Australian art for encouraging a strong focus on colour and experimentation among his pupils, who included the author of this portrait and other subsequently important Australian artists such as Roy de Maistre, Roland Wakelin, Norah Simpson and Grace Cossington-Smith. Signed and dated l.r. corner, red oil "Evelyn Chapman/ 1911". Sarah Engledow, Portrait (no.28) , 'Lovers of light', pg. 16-21, Canberra, Winter 2008, 19, 20, 21 (colour illus.). William Moore, The Brisbane courier , 'Art and artists. The Art Society', pg 22, Brisbane, 27 Oct 1928, 22. The Sydney Morning Herald , 'Royal Art Society. Cabinet exhibition', pg. 13, Sydney, 18 Mar 1911, 13.